The second edition of Georgia Gold – our focus on Georgia companies that are at least 50 years old – takes us from the mountains to the coast and points in between, to businesses dealing in stuff you walk on, stuff you sit on, the movement of that stuff around the planet, and the last stuff you’ll ever need. These four companies have existed for a combined 340 years. All of them have at least some family connection to a previous generation (or generations), but only two are actual family businesses. We’ll begin with the oldest of the bunch, a home furnishings retailer known throughout the Southeast, Haverty Furniture Companies, Inc. – one of the few existing companies that went public before the Great Depression. Havertys (they removed the possessive apostrophe about 15 years ago) had its initial public offering in October 1929, a few weeks before Black Thursday, and they’ve been mostly in the black ever since. The timing couldn’t have been better, according to Havertys’ President and CEO Clarence H. Smith. “Truth is, we were really very lucky,” says Smith, whose great-grandfather, James Joseph (J.J.) Haverty, founded the Atlanta-based company in 1885. Looking to finance the continued growth of the company, Havertys accessed a booming (if doomed) public market in stocks with its IPO. Fast-forward to the global Great Recession, fueled by the bursting of an $8-trillion housing bubble, the worst economic crisis since the Depression. A company that sells home furnishings would not escape unscathed. They cut staff, they closed stores; but they remain a strong presence within their established footprint – the Southeast and some of the Midwest. Havertys has about 120 stores in 17 states and more than 3,000 employees. Sales were up slightly in 2011 (to the tune of about $621 million), and the company is now in the midst of investing more than $15.5 million in improvements and additions to its stores. Today, as a public company, Havertys has two classes of stock traded on the NYSE. While the family controls the majority of the voting stock, it isn’t a family business. But the family remains integral to the leadership of the company, with several members serving on the board of directors and Smith at the helm. Smith’s great-granddad began the company with a single store in downtown Atlanta, and shortly thereafter entered a partnership with Amos G. Rhodes to form Rhodes-Haverty Furni-ture Company. Then J.J. moved the family to St. Louis to expand the company’s reach, returning to Atlanta for good in 1894. Rhodes and Haverty split amicably in 1908 and co-existed in Atlanta for a century – they even split up the cities and territories where they operated so as not to compete directly. The families also remained connected through the Rhodes Haverty Investment Company for a time. In the 1920s, and especially after acquiring all that cash with the IPO in 1929, J.J. Haverty started building what would become his most famous legacy. “He was a passionate art collector, and that became his full-time endeavor,” explains Smith. Haverty’s collection became an early foundation of Atlanta’s High Museum of Art. His other legacy, of course, is the stuff filling homes across the country, high-quality stuff to sit on or sleep on or light a room. For many decades, Havertys sold the high-end brands made by a number of other companies, but for the past 12 years they’ve built their own brand, stamping the Havertys name on commissioned products from around the world. They’ve built a distribution network for a flow of goods from Asia, and in addition to the many stores and showrooms in the Southeast, customers from anywhere in the world can now buy online, spreading the company’s reputation around the globe. Havertys was named one of the 10 Most Trustworthy Retailers by Forbes in 2010. Just like the company that sells them. David Jolly believes the good Lord must have a wicked sense of humor, because when he was a young man, about the same age his oldest son is now, there were two things he swore he would never do. “I was never gonna return to Dalton, Georgia, and I was never gonna work in the carpet industry,” says Jolly – now the president and CEO of J&J Industries, the Dalton-based carpet company his grandfather co-founded in 1957. After three-plus years in the army flying helicopters, in places like El Paso, Texas, and the Persian Gulf, the joke was on him. Not that he disliked the military experience, but there’s that old saying about absence and hearts growing fonder. “Dalton and the family business didn’t look so bad after a while,” says Jolly, who has no idea whether or not his oldest son, Rollins (named for company co-founder Rollins Jolly), will want to take the baton from him. When Jolly and his partner Tom Jones formed J&J Rugs in 1957 with 15 employees, they basically took odd lots of yarn and made candy stripe carpet. Ten years later they rechartered as J&J Industries and refocused the company on making only commercial carpet. 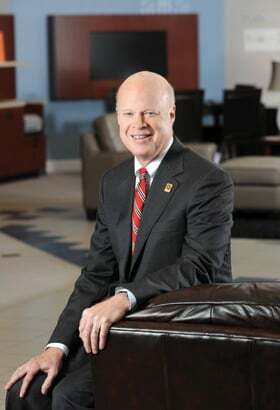 Today, the family business has grown to include more than 700 employees, small compared with some of the other Northwest Georgia flooring giants, like Shaw Industries or Mohawk, but safely occupying its niche. Corporate offices are about 55 percent of J&J’s market, but the company remains strong in education and healthcare and in retail establishments. Since the acquisition of Templeton Hospitality Carpet in 2010, which was a small $5-million to $6-million business, they’re underfoot in a growing number of hotels. It’s a private company, and Jolly is tight-lipped about their sales figures; but he figures they produce in excess of 10 million yards of carpet a year. Especially during a down economy. “The benefit of being a private family business is, we have no timelines to sell our company, to dress up our balance sheet. We want to pass this company along to the next generation, and we want it to be in at least as good or better condition as when we got it,” Jolly says. This concept of sustainability ripples through the company’s culture. They were among the early environmentally conscious flooring companies, launching the “Green Team,” a group of employees focused on sustainable processes, in 1991. The zenith is probably the 20-acre portion of its campus that J&J developed in 2003 as a U.S. Nature Wetland Conservancy, which acts as a filter that purifies storm water run-off. The parcel was donated to the city of Dalton for community use. That sense of community is also thick in J&J’s bloodstream. Company executives chair the local board of education and the board of the local utility company. Jolly chairs the board of a local private school and claims the company is the city’s per-capita leader in donations to the local United Way. He expects it to be that way for the next 55 years and beyond. Since 1930, the D.J. Powers Company has dealt with the multiple intricacies of moving stuff across international borders on behalf of its clients. Serving as the key liaison between importers and exporters and government regulators, the Savannah-based customs brokerage and freight forwarder serves a wide range of clients, from locally owned small businesses to government agencies (like the Department of Defense) to Fortune 500 companies (like Coca-Cola). Powers’ job, basically, is to track the whereabouts of cargo across the globe – to navigate its customers’ goods through tangled federal, state and local regulations. Founded by its namesake, D.J. Powers, as a part-time endeavor, the company (one of the oldest, if not the oldest, custom brokerages based in Georgia) started growing into a full-time brokerage in the 1950s, when the Port of Savannah was experiencing accelerated growth. It changed hands in the 1960s, when Earnest Carter bought the company from Powers. Carter turned the business over to his son Richard Carter (and partners) in 1985, and they still own the company. Willis entered the picture in 1995. “The company philosophy always has been to take care of our employees. They are the visible face of our company, and when they are happy, our customers are happy,” says Willis, who stresses the importance of “account ownership” by Powers’ employees. “A lot of larger corporations in our space are system driven – the employees are plug-and-play people; it’s like a production line. At the end of one process, they hand it off to an employee for the next process,” Willis says. “In the system-driven way of working, the employees don’t actually know the clients; they don’t build relationships. The company, with 75 busy, multi-tasking employees, has seven offices around the U.S. (including Charleston, S.C.) and has recently added offices in the Netherlands and China. Globalization has been an obvious game-changer for Powers as more people can buy more stuff from more distant places at the push of a button. The legendary high school football coach died suddenly in the spring of 1996, and all of Valdosta wanted to honor him. But they needed a good quarterback to direct Nick Hyder’s last memorable moment on Cleveland Field. In steps Britt McLane. Today, Carson McLane, Inc. conducts more than 500 funerals a year (“All of them equally important,” Britt says), but Hyder’s remains one of the more unforgettable services in the company’s 76 years of existence. Now president, Britt has taken on full-time management of the funeral home his grandfather, and company namesake, founded in 1936. His father, Tyson McLane, remains chairman and works part-time these days. But the McLanes always have defined their funeral service company as something more than a business. For many years, the company also provided ambulance service – typical among funeral homes in an earlier time. In fact, Tyson remembers when South Georgia Medical Center opened in Valdosta, and as a young teen he helped his father transport patients from the old Little-Griffin Hospital to the new medical center. They gave up the ambulance service in the 1960s, bought a cemetery in 1979 (McLane Riverview Memorial Gardens), added a crematory, and have added funeral homes in Lake Park and Hahira to go with the main location in Valdosta. In addition to Tyson and Britt, there are six other licensed funeral directors and a total company staff of about 30. The company may expand again, and it’s been on Britt’s mind lately; but he isn’t in too big a hurry. “I want to be careful and don’t want to build something that’s beyond the capacity of future generations to manage,” says Britt, who has three children.